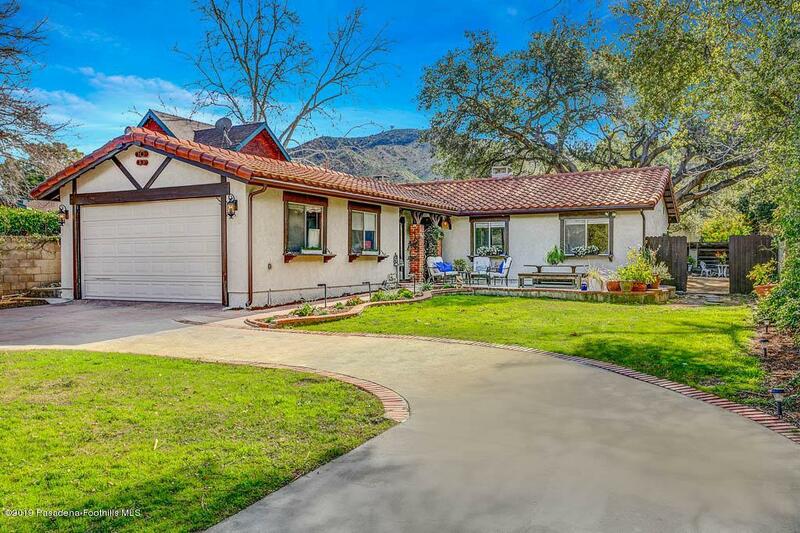 Gorgeous meticulously remodeled Tuscan Ranch- style home on a large flat on a cul-de-sac in desirable South Sunland? Talk about curb appeal, this home certainly has it all with a wrought iron gated entry, yummy veggie garden shaded with a huge gazebo, big grassy play area, spacious patio, fresh exterior paint, new lighting, circular driveway and oversized garage...and that's just the front yard. Open family room and gourmet kitchen both enjoy picture views of the incredible backyard. The Chef's kitchen is really the heart of this home featuring a large peninsula where friends and family can gather around. There are tons of handsome soft close cabinetry, ancient quartzite stone countertops that have been in several showcase homes, Viking appliances, quality LED pendant lights as well as recessed LED lighting, and a professional La Fleur deep sink complemented by a magnificent Breeze touch faucet. The formal dining room is large enough for most big gatherings and enjoys an eight-foot picture window to view the private front patio and entry. In the bedrooms you'll enjoy California Mahogany wood floors, master with walk in closet, remodeled bath. The back yard is an oasis where you'll enjoy relaxing or entertaining. This is a rare offering and a must see!